There are a lot of juice companies out there these days, from the big guys to the small batch crafters like us. Unfortunately, a lot of them pasteurize their juice, which means it’s boiled and cooled before it’s ever bottled. Something you’d never do at home, with fresh-squeezed juice. That's why we choose High Pressure Processing (HPP) instead of heat pasteurization for our juices. We call our juice raw because it is never heated. We use pressure to preserve the flavor, color, and nutrition instead of heat. 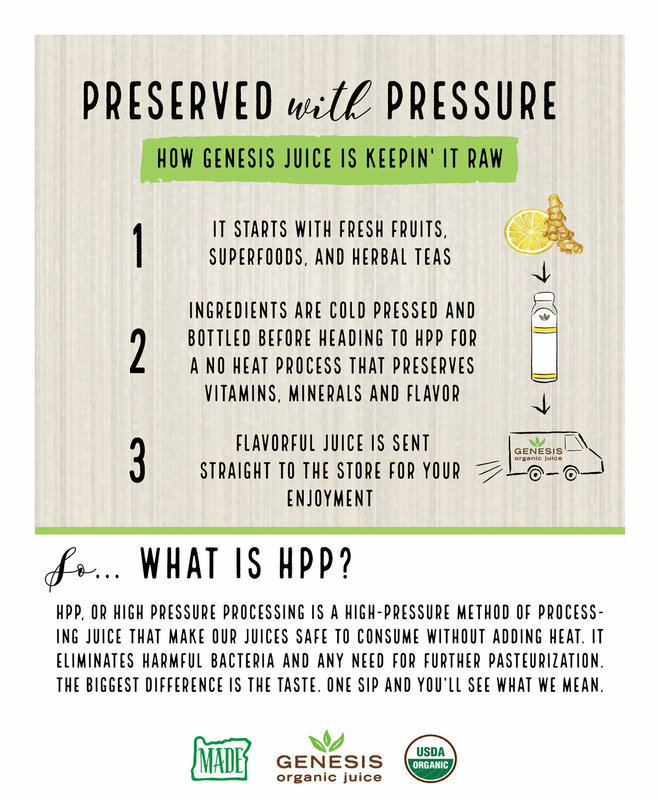 HPP is a big deal in the juice world, but we find most people asking, “What is HPP anyway?” So, we’re going to break it down for you with this little infographic and quick history lesson. Genesis Organic Juice uses a high pressure method, called High Pressure Processing (HPP), to make our juices safe to sell and consume without adding heat. HPP is a big deal in the juice world, but we find most people asking, “What is HPP anyway?” So, we’re going to break it down for you with the above infographic and quick history lesson. After government regulations banned raw juice, we were one of the first companies to adopt HPP, a no heat method of pathogen reduction, which guarantees the juice is clean and safe without cooking out most of the nutrition and taste. The nutritional value of juice made using HPP is better than heat pasteurized juices because the vitamins, minerals and antioxidants aren’t damaged or degraded during the process – they’re kept raw and as nature intended. The biggest difference though, is in the taste. One sip, and you’ll see what we mean. Cold pressed refers to the way juice is extracted from fruits. It simply means squeezed without introducing heat or blending. Our fruits are all cold pressed.